The major populations of Persius Duskywing today are in western states. The eastern nominate subspecies, Erynnis persius persius is disjunct, and has apparently undergone drastic decline in its northeast range. It is an endangered species in Massachusetts, Connecticut, New Hampshire, New York, and Ohio, and is probably extirpated in Vermont and Maine (http://mbs.umf.maine.edu/ ; McFarland and Zahendra 2010). Until the Wild Indigo Duskywing (E. baptisiae) was formally described by William T. Forbes in 1936 (Forbes 1936), lepidopterists included it, and sometimes even Columbine Duskywing (E. lucilius), under the heading “persius.” These three duskywings are difficult to distinguish even today and are sometimes referred to as the “persius complex”. Thus, although Samuel Scudder named and described Persius Duskywing in 1863, calling it "everywhere pretty common” in New England (1889:1472), all his and other early records tell us hardly anything, because they do not distinguish the true Persius from the Wild Indigo Duskywing. Persius Duskywing can be confidently identified only through genitalic dissection and the presence of raised hair-like scales on the wings. Of the many 19th century "persius" specimens which are still extant in museums, only those which have been dissected and "determined" by an expert can be considered reliable. In 1964 lepidopterist J. M. Burns examined some 17 Massachusetts specimens in the Harvard MCZ, determining through dissection that they were in fact Erynnis persius persius. These true Persius Duskywings include two 1897 specimens from Wollaston (Quincy) (5/10 and 5/22, F. H. Sprague), three 1840-1870 specimens in Scudder's collection (1, 1840, no loc; 1 W. Roxbury, E. Burgess, n.d.); one 1890 specimen from Wellesley (6/3, A. P. Morse); four 1897 specimens from Waltham (5/15, C. Bullard); two 1919 specimens from Tyngsboro (6/7, H. C. Fall); two 1930 specimens from Walpole (5/12; no coll. ); and two 1942 specimens from Wellesley (5/5, V. Nabokov). In addition, at Yale Peabody Museum there is a seemingly credible 1942 specimen taken at Somerset Junction, Fall River (6/15, W. P. Rogers), determined to be Persius by W. T. Forbes in 1942. On the basis of just these specimens, Persius Duskywing would appear to have been quite findable in eastern Massachusetts from about 1840 through 1942. Literature reports are more extensive, but cannot be relied upon. For example, Farquhar (1934) said he had seen specimens from Malden, Dedham, Woods Hole, Marblehead, Middleton, Stoneham, Forest Hills, and even Phillipston in western Worcester County, but he rightly notes that many of these could actually be another duskywing species. After 1942, there are no reliable Massachusetts museum specimens until 1984. Whereas Columbine Duskywing often occurs in alkaline habitats, and uses only Aquilegia canadensis as a larval host plant, the eastern subspecies of Persius Duskywing is confined to dry pine-oak areas, often acidic, and uses only wild indigo, Baptisia tinctoria, in our area, although it is also found on wild lupine (Lupinus perennis) in the midwest. Schweitzer refers to wild lupine as the preferred foodplant (NatureServe 2012). Both Columbine and Persius Duskywings have declined here in favor of the more adaptable Wild Indigo Duskywing. Wild Indigo Duskywing uses the same host plants as Persius, but has also adopted the introduced and widely planted crown vetch (Coronilla varia), as well as a wider range of Baptisias. Wild Indigo has at least two generations per year, while Persius Duskywing is univoltine. Distinguishing Persius Duskywing from Wild Indigo Duskywing requires expertise and a specimen in hand; wing hairs and genitalia must be examined through dissection. Photographs are suggestive but inconclusive. E. persius persius, the eastern subspecies, inhabits sandplain pitch-pine scrub oak barrens, open oak woodland, and other disturbance-dependent habitats which have either of its two known host plants, wild indigo or wild lupine. Adults fly from early May through mid-June in Massachusetts (Massachusetts NHESP 6/2007, M. Nelson). 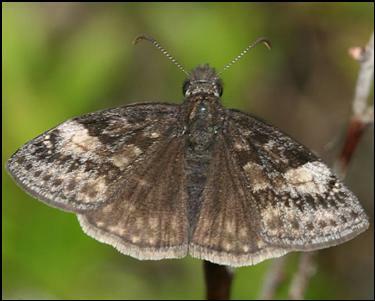 Factors in the decline of Persius Duskywing include habitat loss, decline of wild lupine, spraying for gypsy moth, and competition with Wild Indigo Duskywing (Schweitzer, Minno, Wagner 2011: 96). Persius Duskywing apparently declined greatly in Massachusetts after about the 1940’s and its continuing presence had been in doubt, until Dr. Dale Schweitzer found the species in 1984 and 1985 in the pitch pine scrub oak barrens at Myles Standish State Forest in Plymouth. Three of his Myles Standish specimens, from 20 May 1984, are in Yale Peabody Museum. Schweitzer also reported that there was no lupine present and that the butterfly occurred near Baptisia (Lep. Soc. Seas. Sum. 1984, 1985). In 1974 William D. Winter confirmed the presence of Persius Duskywing at the Concord, New Hampshire, pine barrens. Four (of many) specimens, male and female, from 1 June 1974, determined by J. M. Burns in 1975, are in the Harvard Museum of Comparative Zoology. As of 2012 this is the only known location in New Hampshire, and the species' presence there has not been recently re-confirmed. Persius Duskywing was not found at Myles Standish State Forest or anywhere else in Massachusetts during the 1986-90 MAS Atlas period. The 10-20 specimens which were taken from several probable habitats proved to be Wild Indigo Duskywing when wing hairs and genitalia were examined by Dale Schweitzer. But in 2001 Persius Duskywing was re-discovered at Myles Standish by Mike Nelson of the state Natural Heritage and Endangered Species Program. His photograph of a male from the Plymouth area appears in the Connecticut Atlas (O’Donnell et al. 2007). Chart 82 below shows his finds that year. Probable Persius Duskywings have since been seen and photographed at Myles Standish State Forest by MBC members in 2005, 2006 and 2007, on trips led by Tom Murray and Erik Nielsen. All sightings were made during the last week in May. Photos from 2006 by Tom Murray and Dale Rhoda appear on the Club’s website www.massbutterflies.org ; see also the T. Murray photo above. As of 2013, Myles Standish State Forest holds the only known population in Massachusetts. In Massachusetts, Persius Duskywing adults fly from early May through mid-June. All MBC sightings have been in the last two weeks of May (http://www.naba.org/chapters/nabambc/flight-dates-chart.asp). By August, larvae enter diapause, and overwinter in this form, completing the life cycle the following spring. The species is univoltine (Mass. NHESP 6/2007, M. Nelson). The Massachusetts Endangered Species Act (MESA) lists Persius Duskywing as an Endangered Species. Possible sightings should be reported at http://www.nhesp.org , but positive identification requires an expert with specimen in hand. Amateurs should not attempt to collect this species. Persius Duskywing is also listed here as among the thirty butterfly Species of Conservation Concern. in the state. With only one population of apparently small size, the species is indeed imperiled. Key threats are habitat loss and degradation, deer browse of larval host plants, insecticide spraying, and introduced generalist parasitoids. In addition, Persius Duskywing probably does not recover from fire easily, and yet fire is often necessary to maintain the habitat (NatureServe 2/2012; Schweitzer et al. 2011: 97-98). In Connecticut, Persius Duskywing is also a rare and state-endangered species. The 1995-99 Atlas found only 2 project versus 10 pre-project records. The species is probably declining, due to loss of open oak woodland and barrens habitat. (O’Donnell et al. 2007: Table 6, 292). Regionally, the eastern sub-species of Persius Duskywing is either imperiled or already gone from all states and provinces in its former range. Fewer than 20 populations are known range-wide. The butterfly is probably no longer found in Ontario, or New Jersey, and possibly not even New York. Michigan and possibly Wisconsin remain possible strongholds (NatureServe 2/2012; Schweitzer et al. 2011).